Where were you in 2002? That was the year Seahawks Stadium opened on the site where the Kingdome was detonated, Eminem topped the Billboard Charts with Lose Yourself, the “Roots” beret was de rigeur at the Winter Olympics in Salt Lake City – and Art at Work: Tacoma Arts Month was born! As we ramp up to the 10th anniversary of one of T-town’s most popular events – a month-long blitz of cultural activities and fun – we’re taking a look back at the inaugural celebration. An impressive menu of performances and live demonstrations marked the first Art at Work. Following the opening remarks of then-Mayor Bill Baarsma declaring November Tacoma Artists’ Month, the non-stop activities began. 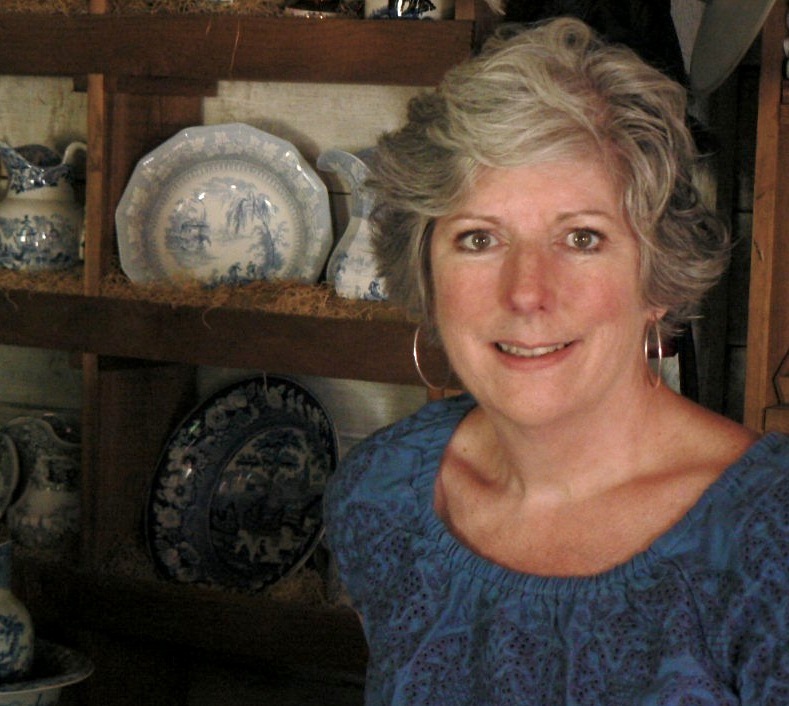 During the studio tour, local artist and high priestess of the mischievous arts, Lynn Di Nino, held court at her studio, showing techniques for sculpting animals out of concrete. “I remember hoards of people coming to see. I had samples showing the various steps, and mixed small batch after small batch to show everyone the wonders of white cement…. [People] walked away swearing they’d dive into their own project [at home].” Perhaps they walked away with a white coating of cement dust, as well. Big-name draws such as the Seattle Symphony, and jazz chanteuse Ernestine Anderson, played dates in Tacoma during November. Chamber music and choral concerts were given by students from the University of Puget Sound. And master glass artist, Dante Marioni, drew crowds for his hotshop demonstration at the Museum of Glass. 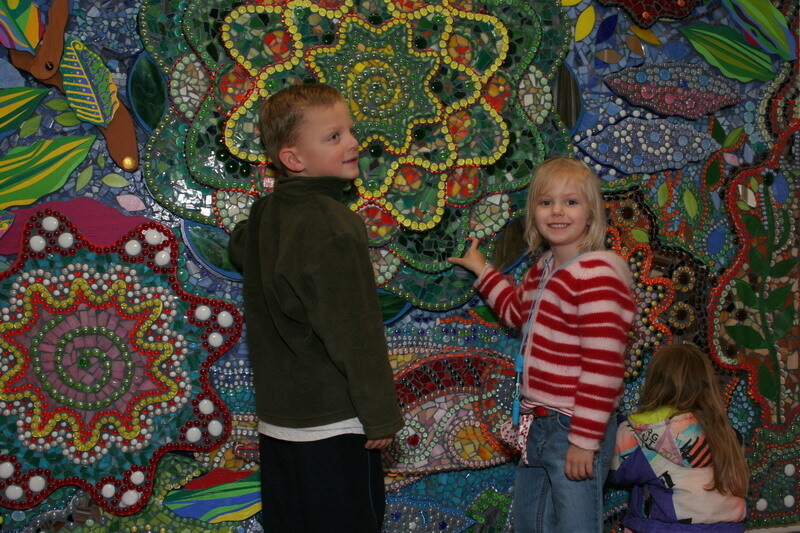 All ages are mesmerized by the jewel-like beauty of Mauricio Robalino's mosaics. It was a great opportunity to see Tacoma’s finest making art. Mauricio Robalino demonstrated the gorgeous and intricate art of mosaic. Sculptor Chris Wooten captivated viewers by magically creating animal forms from natural materials. Jill Nordfors Clark took the road less traveled, creating a unique 3-D sculpture out of natural hog gut. Terra Lea Allen performed Bittersweet, a one-woman performance about chocolate. And Jennifer Tonzi demonstrated the fluid grace of ashtanga yoga. Damaris Hayden Classical Ballet treated viewers to a preview of dance works. The Pantages Theater offered visitors a backstage peek into the inner workings of one of Tacoma’s historical gems. And the Freighthouse Light Brigade illuminated the Museum of Glass, an event documented by photographer Michael Williams. There were 85 activities on the month-long calendar – are you getting the picture? Add to that the open-studio tour, in which 38 artists opened their doors to the public and put their creative process on view. This year, Art at Work is bigger than ever, with more than 300 activities scheduled – many of them free – and 57 artists on board for the studio tour. So get ready, Tacoma, and mark your calendar for art in November! 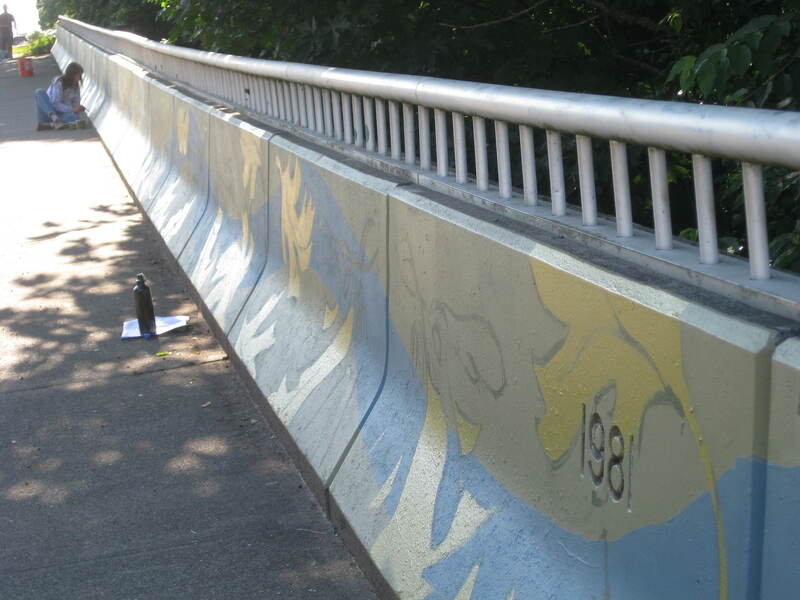 Our team of fifteen muralists have worked quickly on the 43rd Street bridge mural! It seems like the design is really coming along and with this past weekend’s nice weather, a lot of progress was made. 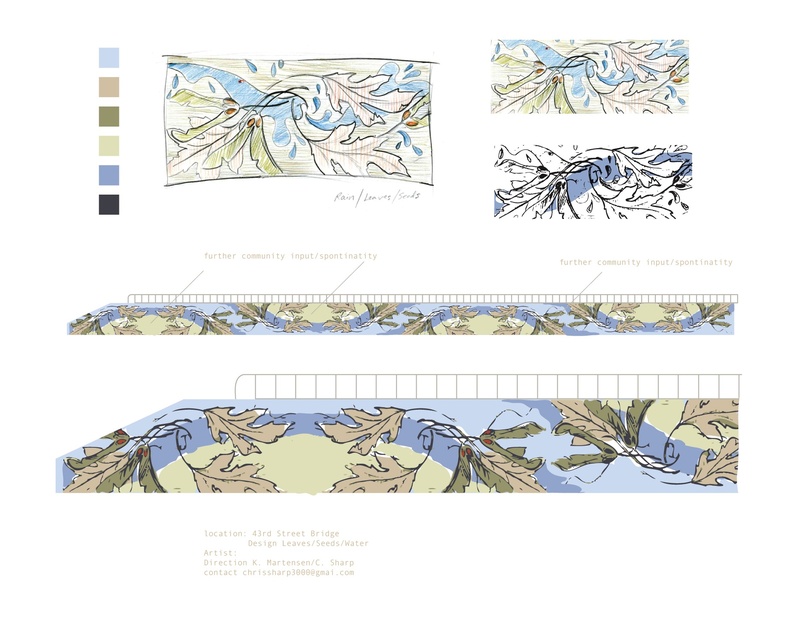 Wondering how the leaf design you saw in last week’s Mural update came to be? Well, after the class of mural students visited the site, they discussed various plans, including the concept of the inverting wave in the background. One of the students used the surrounding foliage and seeds as a design element, and soon a fully-realized concept was developed! It was presented to the McKinley neighborhood group and the rest is, well, history. Meanwhile, painting on the Bergerson Terrace wall has begun! 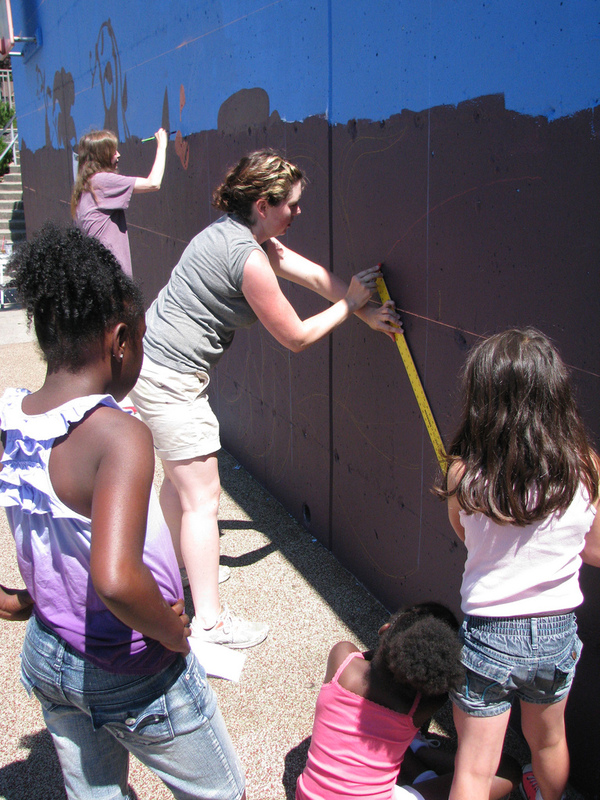 The wall is located next to the play area outside of Bergerson Terrace’s community center, at 5301 S. Orchard Street. The wall will soon be covered in a design that was developed with community groups nearby, like Tacoma Housing Authority. Keeping kids in mind, the design is bright and whimsical, and includes images inspired by the children who play at the Bergerson playground and community center. Our muralists will be splitting their time between the 43rd Street site and Bergerson Terrace for the next few painting days, until the 43rd Street mural is finished. Then, they will concentrate their efforts on Bergerson Terrace. Before we know it, both of the training murals will be completed! If you want to catch any of the action, be sure to stop by either site this coming weekend to see the finishing touches. You’ve probably heard about the new Link light rail station that’s going in this month by Commerce Street and S. 11th, right? 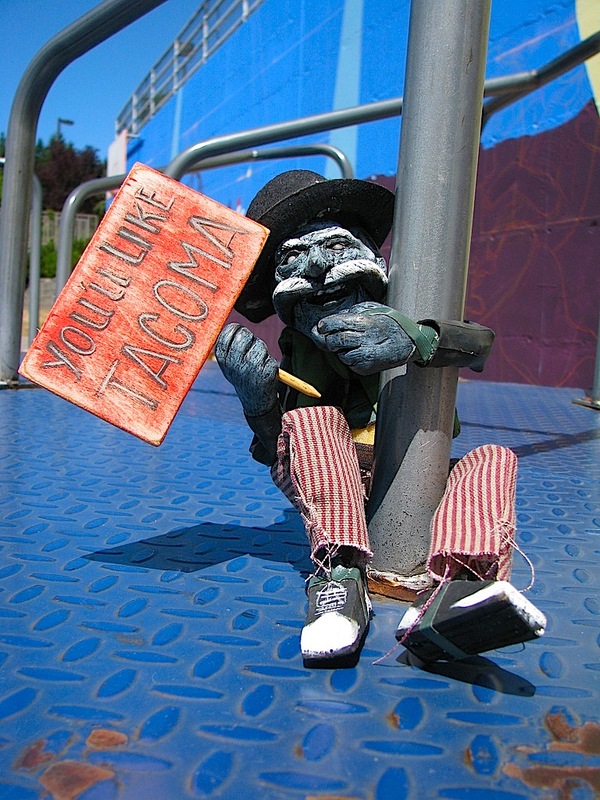 It’ll be a great convenience for anyone going to the Tacoma School of the Arts or the Pacific Plaza. 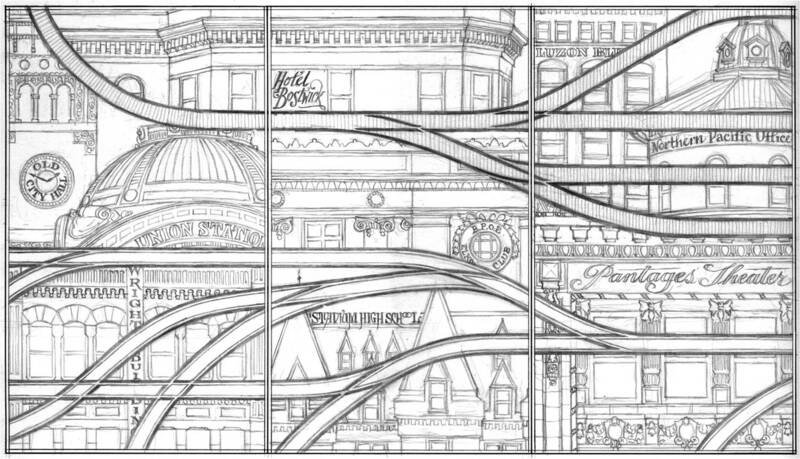 But more than just another stop on your morning commute, the new station will also feature some great artwork by local artist Chandler O’Leary. Earlier this spring, we put out a call to artists to create a design that would be suitable for etching into the glass panels of the shelters at the new station. O’Leary’s design, shown below, pulls inspiration from Tacoma’s rail story – past, present, and future. It consists of two distinct rail lines; one represents traditional railroad tracks, while the other represents our modern light rail tracks. The traditional railroad track at the top left branches out into many tracks, symbolizing Tacoma’s transition to an urban hub. The light rail line, on the other hand, begins as several tracks that converge into one – depicting the end of Tacoma’s streetcar system, and our path into the future with our Link light rail. In the background, O’Leary chose to illustrate some of Tacoma’s most iconic and historic buildings. Every structure shown has some connection to our rail system – having existed along a previous streetcar line, the current light rail line, or overlooking our railroad line. 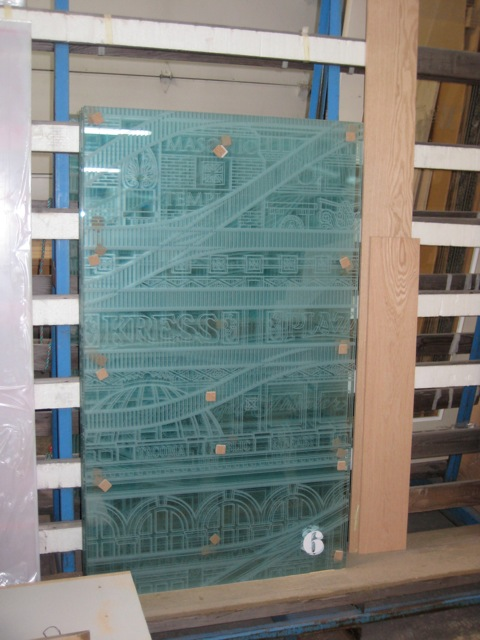 Glass panels are etched with Chandler's design. Here is what the design looks like etched into glass waiting for pickup at Bancheros Glass and Etching Company. Each panel is numbered to insure proper installation. Look for the complete installation this August when the shelters go up at the new light rail stations at Commerce and 11th! When artist-architect Robert Horner chose a building technique called “rammed earth” to create his Tidal Resonance Chamber, on Tacoma’s tideflats, he utilized a construction method that dates back thousands of years, to the Neolithic age. Yet the “earthen” chamber, a clean-lined trapezoid that harbors a 2,500-gallon tank of water pumped from the adjacent Thea Foss Waterway, is thoroughly modern in design – and it addresses contemporary concerns of ecology and sustainability. The former student of microbiology notes, “Estuaries have always fascinated me, especially how they serve as bio-filters for the planet.” Appropriately, the roughly 12′ x 18′ chamber is sited next to the Center for Urban Waters, a marine research facility housing the city’s Environmental Services Division, University of Washington Tacoma labs, and the Puget Sound Partnership. The next stages of the Tacoma Murals Project are moving quickly – the 43rd Street bridge training mural is already in progress! With several community meetings behind them, the teaching artists and muralists of this year’s Murals Project are looking forward to attacking the wall this weekend with prep work and priming, in the hopes of getting the bulk of the mural done within a week or so. 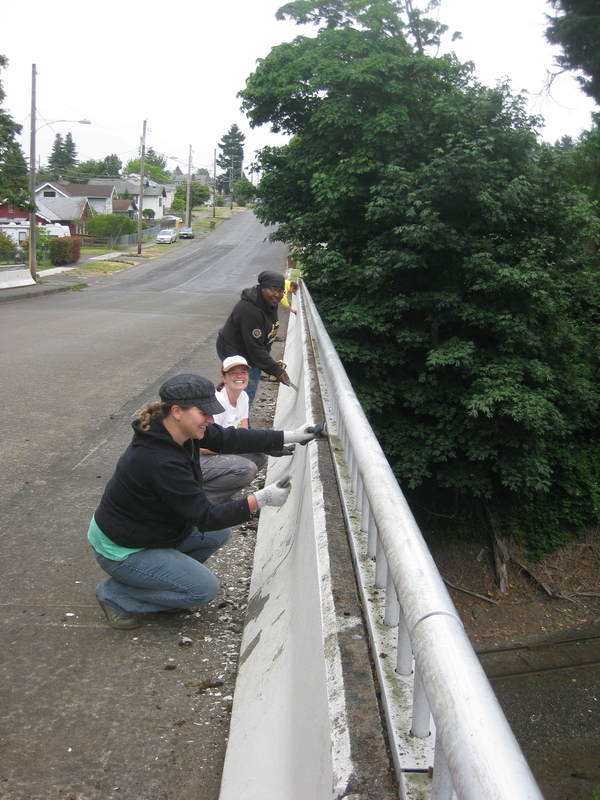 A few of the muralists clean and prep the barrier of the bridge. Photo courtesy of Kelda Martensen. On Thursday, the group began prepping the low barrier by scraping old paint and moss off of the wall. Priming is slated to begin today, and the goal is to have the wall completely primed and partially painted by the end of the weekend. The muralists have already met with graffiti cleanup crews and neighborhood groups to learn more about the community’s assets and liabilities. They’ve gathered responses and other input and developed a design proposal, shown below. “With our design,” says lead artist Chris Sharp, “we’ve left room for further community input and I can foresee us having a spontaneous component finishing the design.” These community meetings have helped the artists gain a better understanding about the personality of the neighborhood, and what its residents hope to see for the mural that will soon be gracing their daily commutes. The proposal design for the 43rd Street bridge. Image courtesy of Chris Sharp. Curious about the design and how it will come to life? Swing by the 43rd Street bridge – near the intersection of E. 43rd Street and E. C Street – between 10am and 4pm on both Saturday and Sunday to see the artists in action. 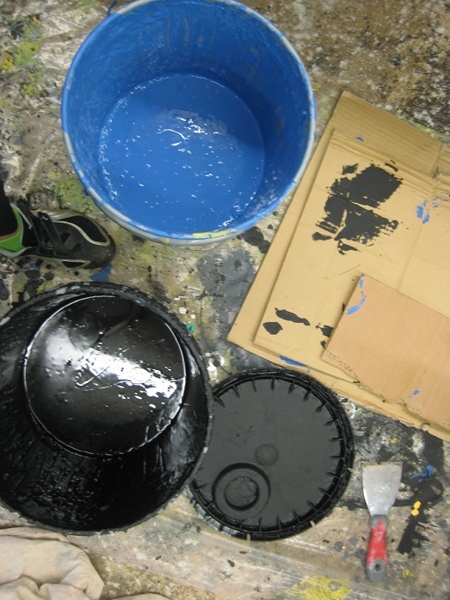 Plenty of painting should be going on this weekend (weather permitting! ), and you won’t want to miss it. Hilltop Block Party! July 21, 5 to 8p.m. 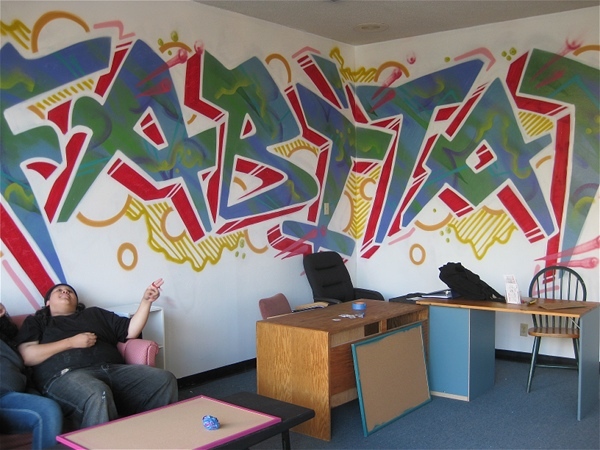 • Fab-5 – The graffiti consortium is launching FABITAT, an innovative creative lab aimed at inspiring underserved youth through the arts. 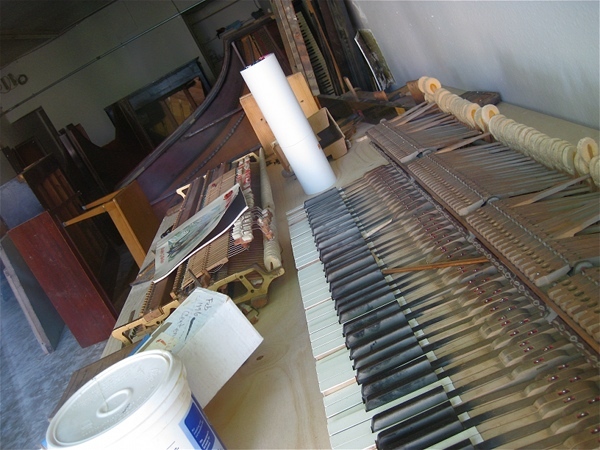 • Nate Dybevik – A musician, composer and apprentice piano rebuilder (training under internationally renowned expert Obi Manteufel), Dybevik will have his dismantled, vintage European piano “projects” on display. 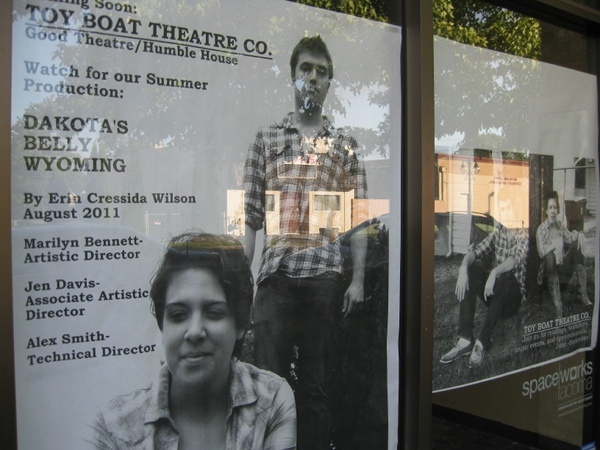 • Toy Boat Theatre – This new theatre troupe is developing a play, Dakota’s Belly, Wyoming, by Erin Cressida Wilson, in conjunction with the theatre department at the University of Puget Sound. Show will open in August. Spaceworks’ neighbor to the north, Fulcrum Gallery, will also be welcoming visitors to the block party with an exhibit of paintings by Peter Scheesley. Pull on your flip-flops and come out to meet the new peeps on the block! The National Endowment for the Arts (NEA) recently awarded the City of Tacoma and our Tacoma Art Museum an “Our Town” grant – one of 51 awarded nationwide! This grant is the NEA’s latest investment in creative placemaking – bringing together public and private sectors to shape the economic and social characters of a neighborhood around arts and cultural activities. Sounds like the perfect award for downtown Tacoma, right? The $200,000 grant will go toward the redesign of the Tacoma Art Museum Plaza and the adjacent Pacific Avenue streetscape. Hopefully, this redesign will increase access to the museum and the connections between the museum district and the rest of the downtown area. Are you excited? Because we’re pretty pumped, and we can’t wait to see the changes. Learn more about the TAM Plaza redesign here. Cost: FREE, pre-registration required. Please fill out a registration form and send to josie.turner.poet@gmail.com. Workshop space is limited to 15.